On July 29, the Territory of Wallis and Futuna Islands celebrates Territory Day. This public holiday commemorates the day that Wallis and Futuna officially became a French overseas territory in 1961. The Wallis and Futuna Islands are located in the South Pacific. They were originally settled by Polynesians. The first Europeans to visit the islands were the Dutch and the British, but it was the French who first settled here. French missionaries arrived here in 1837 to convert the local population to Roman Catholicism. In 1887-88, three local kings signed treaties that established a French protectorate over the islands. They became part of the colony of New Caledonia. In 1917, the islands were turned into a separate colony, which was still subordinate of New Caledonia. In 1959, a referendum was held in Wallis and Futuna. 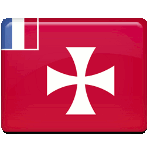 The inhabitants of the islands voted to end the subordination to New Caledonia and become a French overseas territory. The Territory of Wallis and Futuna Islands was officially created on July 29, 1961. Although in 2003 it was transformed into a French overseas collectivity, its official name remained unchanged. Territory Day is one of the biggest celebrations in Wallis and Futuna, along with Saint Pierre Chanel Day and Bastille Day.